Ryan Thompson has accepted an invitation to participate in the Utah Jazz fall camp. He played for Sacramento during the Summer League and had an amazing Portsmouth Tournament prior to the NBA Draft (despite not getting drafted later). He's an intriguing player... someone who I thought the Jazz would really consider drafting in the 2nd Round. I really like this kid. He's got great ability and may have a chance to make the roster. He'll be in a battle with Othyus Jeffers to make the team. 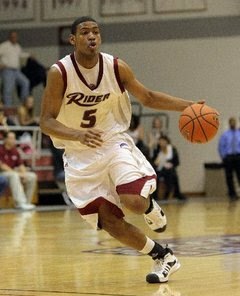 From the looks of his homemade, shakily filmed highlight reel, he hit a lot of threes at Rider's high school looking gym.